I was totally out of commission for over a week due to a terrible cold. I’ve been going nonstop since my California vacation in June. And getting eight hours of sleep was nothing but a feint memory. I was doing relatively OK, albeit a little tired, until a couple of weeks ago. Then… ugh. It’s funny how you are forced to find the time to rest once your body feels like it’s been hit by a mac truck. Anyway. All I craved throughout this ordeal was hot soup – Korean soup to be specific. I didn’t have all of the ingredients. So I made do with what I had. Luckily, anchovy-dashima stock (common Korean soup base) is super easy and quick to make. And I had some miso on hand. So I decided to make some adjustments to the Korean soup I had in mind and made some Korean-style miso noodle soup instead. It was exactly what I needed, so much so that I made it three times during the week. I’m sure some of you have never heard of anchovy-dashima stock. But if you love Korean food, you’ve probably tasted it. It’s the base of many Korean soups, including noodle soups. Unlike other types of stocks, it’s pretty quick to make. And you can make a big batch and store it in the fridge for about a week or freeze it for much longer. 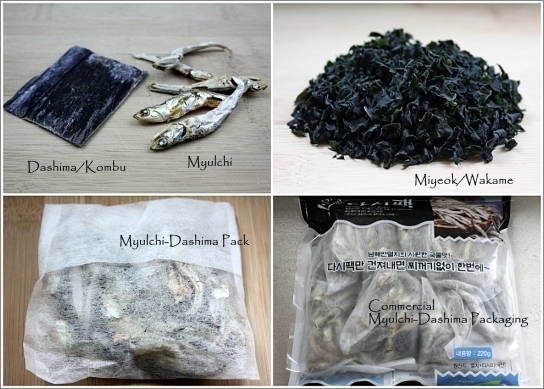 Anchovies and dashima are readily available in Korean markets. You can also purchase them on Amazon. Of course, you can always use prepared chicken or veggie stock. It will still taste good, but nothing beats the real thing. For more info on these ingredients, see Cook’s Note below. Additionally, red miso or brown rice miso should be used for this soup. They (darker miso generally) are closer in taste to the Korean soybean paste (doenjang or dwenjang). The lighter miso will not yield the same results. You can still make this soup even if you don’t have every item on the ingredient list. Just make sure you have an onion and garlic cloves for the stock, and miso for the soup base. Other than that, read the Cook’s Note for substitution suggestions. Enjoy! Soak the dried wakame in cold water for about 10 minutes. Drain. Set aside. Prepare the noodles according to package directions, but undercook it by about a minute. Drain. Set aside. Add kombu/dashima, onion, garlic, and water to a pot. Bring to boil on high heat. Once it comes to a boil, add dried anchovies. Lower the heat to medium-low and continue boiling. Leave the pot UNCOVERED AFTER the dried anchovies are added. Boil for another 10-15 minutes. Discard onion, garlic, kombu/dashima and anchovies using a slotted spoon. Add the rehydrated wakame/miyeok, mushrooms, and tofu to the pot. Bring back to boil and continue boiling for another 3-5 minutes. Then add the noodles and spinach. Once the noodles are heated through and the spinach has just wilted, remove from heat. 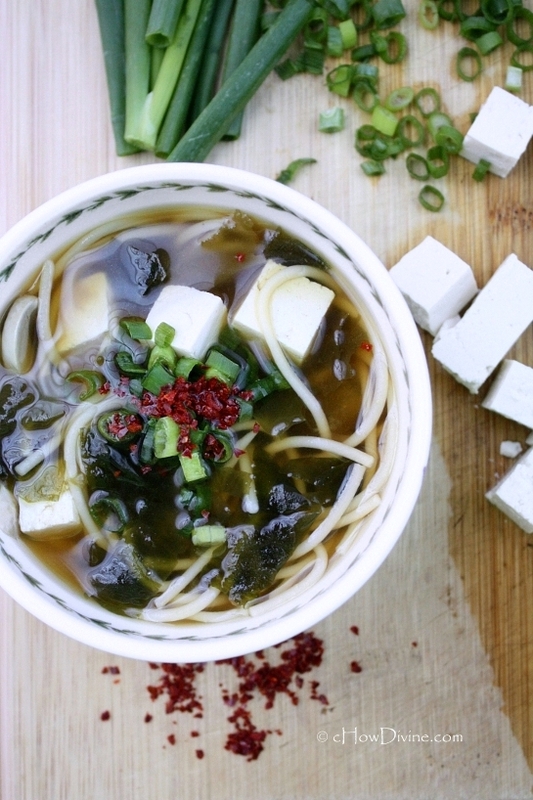 Dissolve miso in a small amount of broth. You can do this in a ladle or in a small bowl. Once dissolved, pour it back into the pot and stir the pot gently to ensure that the miso is evenly distributed. Serve hot with some chopped scallion and gochugaru if desired. If you don’t have dashima or dried anchovies, you can add about 3-5 squirts of fish sauce when the wakame/miyeok and tofu are added to the soup. If you want to keep this vegan, use a couple of dried shiitake mushrooms in place of dried anchovies. Just rinse them first to remove any debris. I topped my soup with gochugaru (Korean red chili pepper flakes/powder). The spiciness of gochugaru in hot soup is believed to clear up the sinuses. If you don’t have wakame or miyeok, just omit it and add a little more noodles. If you are using wakame or miyeok, keep in mind that the longer you boil, the milkier and brinier the broth will become. What a pretty soup! This looks wonderful – love all the great flavors you’ve included in it. Really a super recipe – thanks so much. Sorry you had such a rough week with that cold. 🙁 Hope you’re feeling better. I’m sure having this wonderful soup three times this weeks helped to knock that cold right out of you. It looks like the perfect soup for the common cold. Thanks for the great instructions because I don’t know if I’ve ever had a anchovy-dashima stock but I have had a couple Korean soups before, so maybe I have. Love it that I can my one at home. Thanks!!! It lasted much longer than I thought, but I feel so much better now. Thanks MJ. This soup did help a great deal. 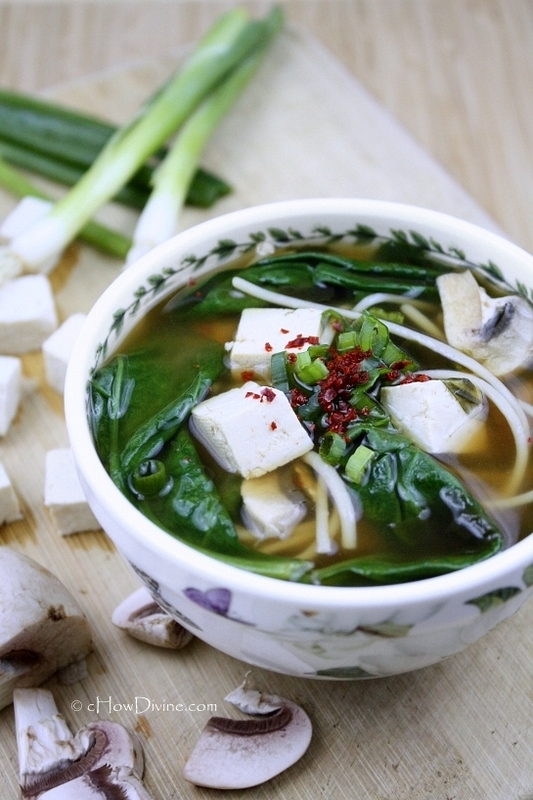 There’s nothing better than a hot, spicy soup to clear a cold-induced foggy head! I’m sure you’ve tasted it if you have have had Korean soups. Even in beef or other types of broths, anchovy and dashima are commonly used. It gives the broth a more complex flavor. I hope you are doing well! Thanks Amy! I love hot noodle soups. I take a short break in the summer time, but they are my go-to dishes for the cooler weather. Have a great week! I see we are both craving soups and noodles. I have had three ramens last weekend 🙂 Your soup looks filling, but healthy and very original for someone who imagines all the Korean soups spicy and red! I have different kinds of salted fish, but they are all smaller. I once tried making a Japanese stock with dried fish and it was a bit too strong for a gentle, light miso and tofu soup, but with the bold Korean soybean paste (I agree it’s closer to dark miso!) it must be perfect! I will be experimenting soon. Thank you for inspiration. Ramen sounds good! I love soup noodles. I can eat them everyday. You should try the Korean soup myulchi. It’s not salty. The stock is pretty delicate. You can even use it for sautés. I’ve even poached eggs in it to go with Asian stir fries. Thank you Sissi! Hope you are doing well! Hope you are feeling better. Wow you got out of bed and cooked while you were sick? I recently had a terrible cold too. It sucked. I lived on Nyquil, cough drops, and hot soupy stuff. I’d imagine that this would have been so good and soothing. And with the days getting cooler, it looks so warm and comforting for any day of the week. I’m feeling much better. Thanks Miss Kim! It was really soothing. I always cook soup for myself when I’m sick if my mom or grandma’s not around. I get extremely particular about my food, probably because my appetite completely diminishes with a cold. Only my mom, grandma, and I know what I like! I know. I’m a total PITA when I’m sick. 😀 Hope you are well! Thanks Sandra! I’m feeling much better now. It was just a common cold. It just feels like death when you get it. I think the change in season/temperature really messes with your immune system. I hope you’re feeling better too. Have a wonderful weekend! I didn’t know Korean store sells dashi pack!!!! I use Japanese dashi pack in my day to day stuff, and some people ask where to get it and I really thought we can find in only Japanese store (actually not all Japanese stores sell this). I’m so happy right now. I’ll check my nearest Korean store to find this. Your noodle soup looks delicious! I am sorry you haven’t been feeling well. 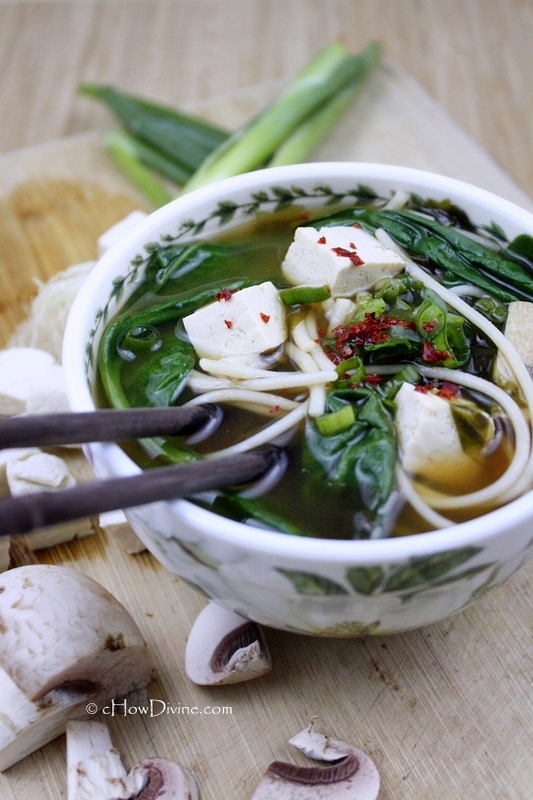 This is a perfect comforting feel-good noodle soup! The dashi packs are so convenient! It’s such a time saver. I don’t think these will yield the same results as the Japanese dashi packs since it’s made with myulchi. But it’s yummy for miso soups! I’m doing much better now. This soup really helped me through it. Hope you’re having a wonderful weekend with your family Nami! How much water do you add to the kombu/dashima broth? The recipe doesn’t say. Thanks! Yes, I’m located in Chicago so there are some wonderful Asian markets. This past weekend I went to the largest Japanese grocery store in the Midwest–the Mitsuwa Marketplace. I was able to find the anchovies by looking at the fish on the package and then reading the ingredients on the back. The anchovies I got were dried, but ground and in little sachets (like tea bags). I was thinking using 2 sachets would be similar to 6-7 whole anchovies. What do you think? The stock/broth from the dried whole anchovies is actually pretty subtle in taste. The anchovies are just dried with nothing added to them. I’ve never used the ground ones. I’m guessing they are Japanese? The ground anchovies might be more potent. So don’t start out using two. Hope this helps Rosanna! The soup turned out lovely! It was a perfect meal for a cold, winter night. Thank you for letting us know how it turned out! I have to agree; it’s perfect for a cold winter night. :) Happy Sunday Rosanna!